Having introduced Filthy Luker’s street art version of space invaders last week, Jamaican beer brand Red Stripe are continuing to cause an arty commotion on the streets with their Make campaign. 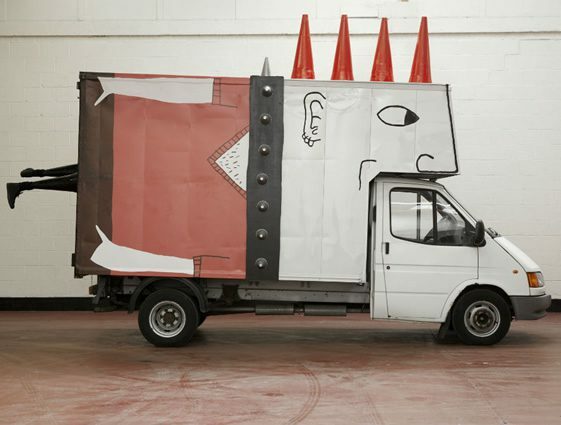 This time hitting the streets of London, Bristol and Leeds with a bunch of old white vans customised by Brit illustrator Rose Stallard, Parisian artist Sandrine Boulet, Berlin’s Sweza, and New York’s D. Billy. Can you tell us a little about yourself and your style? The expression of my artwork can be photographic but I also enjoy using paper, clay, even sometimes videos or other materials, I take photographs but sometimes I do real stuff… I like the idea of playing with different ways of seeing and making things. I would like my work to be eclectic and transversal. I also like to be “here and somewhere else” in between in a way, that’s why when I do an exhibition, I like art to be where people don’t expect it “can be”, it means that you don’t have to have the artwork on the wall. I am also interested and care a lot about all the forgotten detail of a place; stains on walls, lights, weird shapes on a parquet floor, funny wall curves and so on. Because all those details of a space make the history and character of a place (for me like the history of a human being with his joy, pain, sometimes scrap memories of hard times and, in a way, it give its life’s print). I try to do a 360° degree intervention, so people can have fun, be surprised, look everywhere around them and re-discover what generally we don’t pay attention to. Today in a way, I prefer things that aren’t extra-ordinary but ordinary-extra and try to experiment that way of seeing this in my artwork. In a way it is also related to peoples way of life nowadays. Today anybody can express themselves if they want, very easily. Digital cameras are simple to use, computers are more and more instinctive (even kids do awesome stuff with them), editing can be simply done with some software, so in a way you just have to create and push yourself and try to do it… see what will happen. Above all that, what is still very important is what you want to say; how you say it, and to have an “eye”. I think that will always make the difference. Have you done anything on this scale before? This was a première fois for me and I am so glad that I had this chance. Last year I customised a little blue building in Toulouse in France for a collective project called j’exp(l)ose. But this was the first time I had to make a van “alive”, so it was new for me – ouhlala. 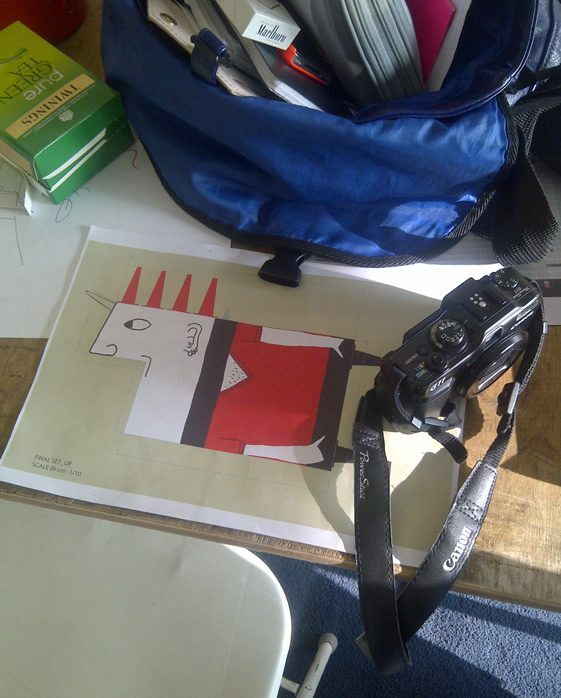 And also to work in London with some very interesting artists was amazing. This was quite a scale too in a slightly different expression of the words, because I found the other artists very talented and seeing them and talking to them makes me want to push myself further. Also all the crew around us were very nice and cool and professional. Working in a collective way is great, because the energy is powerful and the mix of people come from different horizons which always gives something interesting, stunning and an unexpected result. 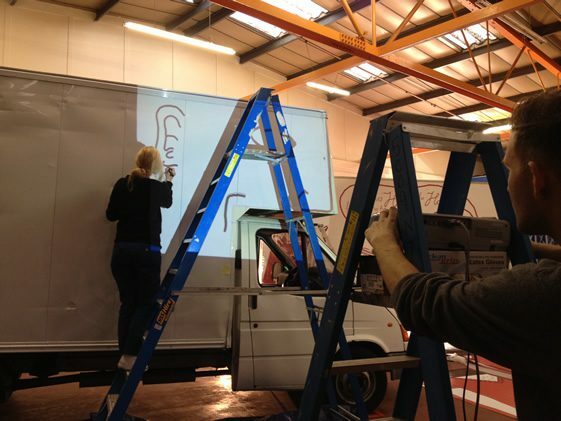 Can you tell us about the interactive element on your van? At the beginning of the story, there is this poor van. Quite basic, common, damaged by shock, quite invisible. You see it on the street and don’t pay attention to it. It seems like it was for me, as if this van had a very boring and conventional life. The base of my work is “caring” about the shape of things and trying to imagine something that will “stand out” of this shape; so first I look at the design carefully. In a flash I noticed that its shape looks like a person, the front of the shape strangely appeared to me as a mouth open, biting. And then because this project was called “Make Art On The Street” and the van was going to go through England – and I really like England – it suddenly happened that I wanted to make a tribute to England as it’s a very rich and paradoxical culture. Full of freedom, because in England you can find so many different people, very traditional British gentleman and suddenly cross a punk in the street – and I love this. So that’s why I’ve made this van into a punk. Because punk culture made things move in England and also in other countries. It was an alternative way of living, doing, and seeing things. I think they’re very “graphic”, with their hairdo and also the music and their art. “Readymade”, because they made something out of nothing. My point of view is that they are strong symbols of freedom. They use creativity and rage to express themselves, just like artists but in a slightly different way – or anyone who wants their own way of thinking. I do not know a lot about punks, but it feels like in our world more and more people are trying to think, act, make, communicate live differently, going out of a system and trying to build a different one than the previous years. So that is why the concept of punk culture, and what it is about, felt totally coherent with my van but also the spirit of the collective four vans. They are in a way, very non-conventional ways of advertising a product and full of subversive-positive entertainment that will make people stop, I am sure, and have a great time. Red Stripe communication is based on the DIY culture and also that seems coherent with the punk culture I guess. Anyway… I think this brand has guts. I also appreciated that we use simple material such as the vans, that aren’t new but second hand. 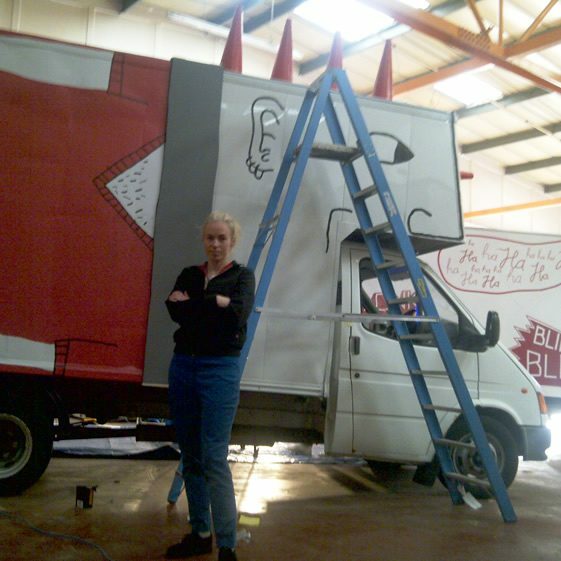 The spikes of the hairdo and the legs of my van are made out of used recycled street cones sprayed in red or black. I hand painted the face and pasted the body onto the van. 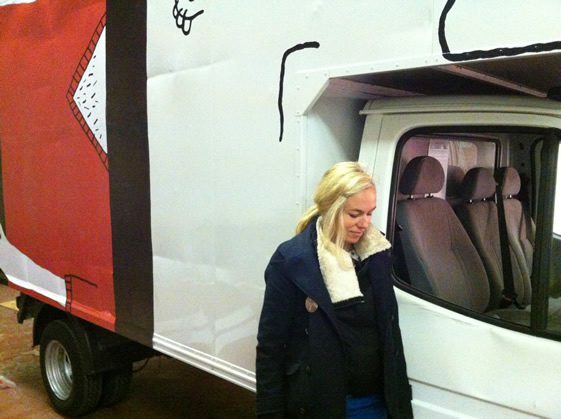 Above all that, what is really important for me in this project is the inside of the van. It is a “gallery for people” because as Marcel Duchamp said (and this man was brilliant – such as Dadaism movement) “you can be an artist without being anything special…” I apologise, I don’t know if it is the right translation in English (on peut être artiste sans être rien de particulier), which means “anybody can be an artist without being nothing in particular”… and I believe in that sentence, in French. 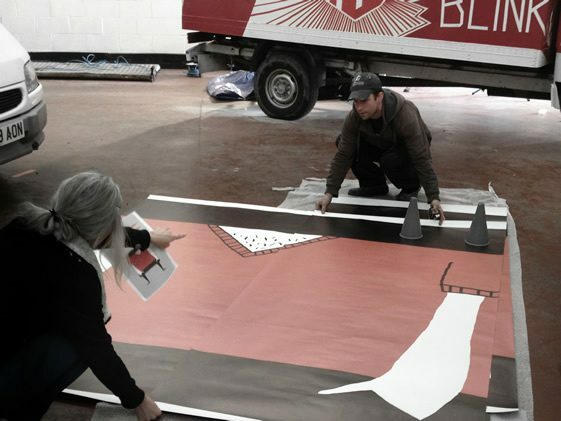 So inside the van, you can find postcards with an outline drawing of the van and it is a workshop open to anybody. Anybody can see further and I hope it will draw its own vision. They are totally free to express themselves and I thought that it would be a nice thing. After giving a title and sign, they will be able to stick their artwork on the gallery by hanging it with a bulldog clip. I thought that was quite surprising and poetic and also that’s a thing I like to do with my work. To do a workshop with people, to transmit and to share. What is the point of creating it just for you? Nothing. It is also a way to say that we shouldn’t judge people on their outside appearance, but look also at what is inside someone, because you can be so surprised. Sometimes maybe real punks aren’t dressed as a punk, but nowadays maybe wear a costume for example and I know some of them. I wanted to imagine that a punk can be very poetic and romantic inside. I don’t like clichés and sometimes I do regret that people or stuff are too easily put into boxes. It needs to be seen a little bit closer, a little bit deeper, a little bit less superficial. That is the paradox of life and the amazing and interesting depth of all human beings, and of this world. It is full of paradoxes, but when opposites mix together, then it gives new thinking, sometimes that’s good when we don’t understand at first sight, when things seems to be disruptive and I like that idea, this is what makes humanity I guess. It sounds like this project could cause a bit of a stir – are you hoping to introduce a new audience to your work? All that I can be sure of is that it will make a lot of noiiiiiiise. I’ve seen and heard the sound system in Rose Stellard’s van… hahaha! It will wake up the street. I saw Sweza’s van and find it such a brilliant, liberating idea for the English people. And D Billy’s van is very impressive because we see the essential works and skills of a “artisan” in typography and graphics. I guess it is the best four vans I have ever seen, and I am so happy about that. I am hoping people will enjoy it as much as we have making it and that they will have a good time all together. We do need collective connections and happy times in this world more and more I guess, and this makes me happy. This project sounds to me like a circus arriving in town, and just like a kid when a circus with clowns, animals, and musicians arrive in town, it was magical, poetic and surreal. Will you personally be touring with the vans – if so, what are you looking forward to most?